The general appreciation for taking care of the earth's resources, of being stewards of creation is being exploited to drive a political and even mythological system of environmentalism. The President of the Czech Republic spoke at the Cato Institute Friday calling "environmentalism" a "religion", and warning against the hysteria being generated by 'global warming' enthusiasts. 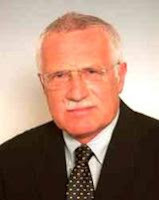 "All of us are very much in favour of maximum environmental protection and protection of nature," said President Vaclav Klaus during a follow-up interview for a Cato podcast. "But it has nothing in common with environmentalism, which is ideological and practically attacking our freedom." There was also an article in yesterday's Sunday Telegraph, Scientists threatened for 'climate denial', reporting on death threats issued to global warming deniers.